Welcome to School of Distance Education (SDE), the University of International Business and Economics. Since 2002, SDE has maintained the leading position in the development of online programs of Economics, Management, Law and Business English that are comprehensive, challenging, accessible, and affordable in China. Our main objective as a School is to develop and offer flexible programs using innovative cutting-edge distance learning technologies to provide our students with updated knowledge. The School offers courses ranging from certificates, diplomas, and degree levels spread across its academic departments. SDE is committed to the highest standards of academic excellence and practical values, which will help students to be better prepared for their career development. A fundamental component contributing toward fulfilling this vision is the student-professor relationship. The abiding goal of our School is to put students first by maintaining close contact between the students and our highly-qualified faculty and administrative staff. As with any new entity, there will be numerous challenges as we reach those high standards of excellence. The dedicated and talented faculty and staff of the School have made a commitment to the strategic priorities and the changes, persevering in providing best services for our students. 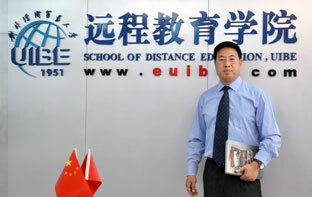 It is my pleasure to welcome you on behalf of the School of Distance Education. As the Dean, I promise that our academic programs will maintain the highest quality and be built on a foundation of excellence and innovation. UIBE is one of the first universities in China to have initiated academic exchanges with foreign academic institutions, which helps thousands of Chinese and foreign students to understand and become familiar with international practices and principles of different fields. I sincerely hope that multi-level and multi-type cooperation will be established in the online-learning field to promote and exchange ideas and experiences with successful institutions and organizations in the world. I invite you to explore our web site further and learn more about the University of International Business and Economics and I invite you to contact our staff if you have any question.